At the National Civil Rights Museum you can interact with the past as you learn about the worldwide influence of the American Civil Rights Movement. The museum, actually a collection of sites and structures important to the movement, offers a one-of-a-kind experience that traces civil rights from our country’s beginnings to the present day. The museum also features 260 artifacts and more than 40 interactive stations where visitors can view films and listen to oral histories. On the left is a bus with a figure of Rosa Parks. 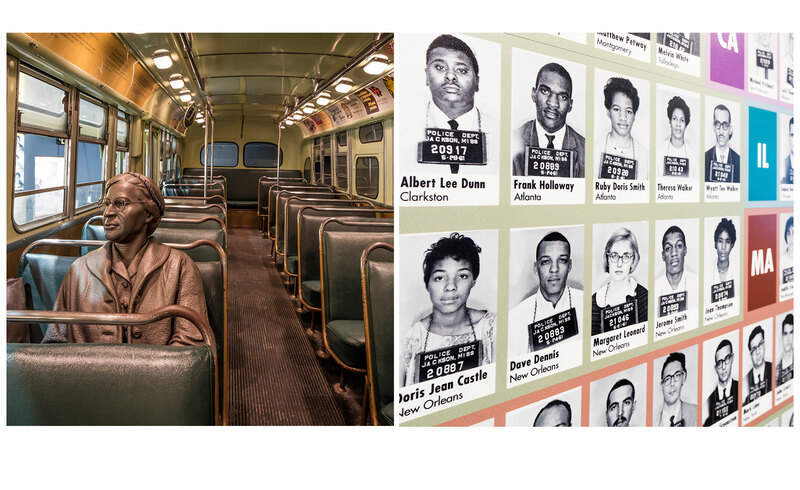 On right are mugshots of Freedom Riders in the Freedom Rides Museum in Montgomery Alabama. This rehabilitated bus station has been restored to how it looked in 1961 and is the site of the attack on Freedom Riders when they arrived at the station.